It is often reported in the press that the UK will not be able to arrange a new trade deal with the EU without accepting the free movement of labor. Why is this the case: What do other countries gain if their citizens come to the UK? Is it just ideology of an open Europe, and fairness that people should be able to live and work where they choose that is driving, or is there also an economic argument? Put simply: It's one of the cornerstones of the “internal market” (the current EU official term for what has also been called the “unique” or “single” market). The theory is that freedom of movement for goods, capital, services and persons ensure the most efficient allocation of resources and convergence between EU economies. Many people seem to imagine it's a detail, something that could easily be extirpated from the rest of EU rules or something other countries forced the UK to accept for unfathomable reasons. It's not, it's an integral part of a coherent package and something the UK was originally very keen on. Similarly, you can't pick and choose between apparently silly regulations like those on the contents of pillows and whatnot, everybody has to abide by the same rules to allow products to be sold across the EU without having to deal with a separate standard on safety, quality, etc. for each country. That's the reason why Norway (which is in the EEA) and Switzerland (which rejected even that) still have to implement most of these rules anyway (with one big exception: agriculture). There is no way around it without seriously endangering the whole construction (which might nonetheless happen, I am not trying to predict where the negotiations will lead). The long-term objective is that EU economies should reach a level of integration such that for each economic decision (hiring an employee, choosing an employer or supplier, buying a product, etc. ), you could transparently make a transaction with a business or person elsewhere in the EU as if it was a business or person in your own country, without worrying about extra paperwork, delays, etc. That's the theoretical and economical reason why freedom of movement for workers was an integral part of the project from the start (back in the days of the European Coal and Steel Community and then in the 1959 Treaty of Rome), long before the creation of the EU and the mostly failed attempts at extending its remit to things like defense or border security or the catastrophic experiment that is the euro. Therefore, the original argument for all this is primarily about economics, as you suspected. Historically, the freedom of movement thus only covered workers. The Maastricht treaty added some limited rights for economically non-active people (e.g. retirees, under the condition that they have sufficient income) and case law extended them (e.g. 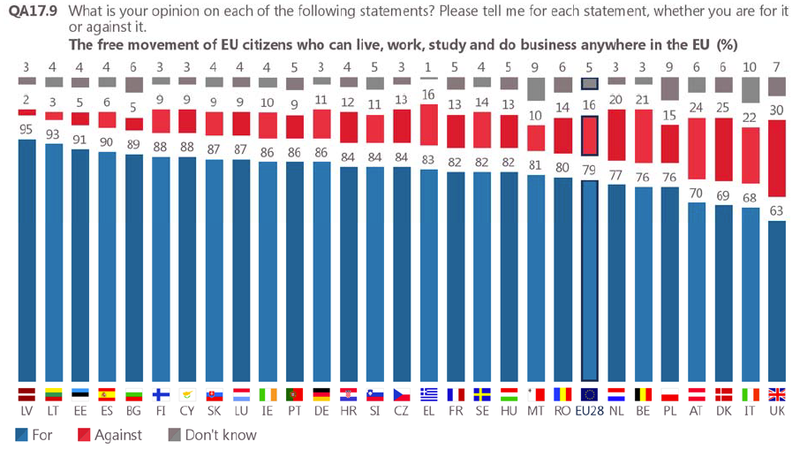 based on the notion that living with your family should be a basic right) but freedom of movement for workers is still the most thorough (and freedom of movement is only about EU citizens; the rules about refugees and the border-free Schengen area fall under an entirely separate set of regulations). The short-term political considerations are slightly different but also go in the same direction. For if Britain is able to extract significant concessions and gets to choose which rules it will continue to implement, why deny that to other countries? Freedom of movement for persons is a particular focal point in the UK debate at the moment (but also implicitly free movement of goods, for that's what all the seemingly absurd rules about pillows, vacuum cleaners, bananas, cucumbers and the rest are about) but elsewhere it will be something else (including the freedom of movement for services – cf. the clichéed “Polish plumber” or the complaints about lorry drivers from Central and Eastern Europe – or capital – cf. discussion about tax deals with large companies in Luxembourg or Ireland). The risk is that we would soon end up with a fragmented market where each country adds friction and bureaucratic requirements in different areas based on its current and changing priorities, essentially rolling back the EU single market. The EU would then revert to the kind of free(ish) trade that currently prevails between countries elsewhere in the world. That would not necessarily be a catastrophe but would clearly mark the end of the single market and the EU as we know it so it's easy to see why countries, parties and politicians who are currently part of it and find it beneficial would not want to go down that road. The single market and freedom of movement (for persons and for other things) are very different in that respect from things like the euro or the Schengen area, which the UK could easily “opt-out” from in the past. Those are merely side-projects, not really tied in a very deep way to the existence of the EU itself. Incidentally, it's interesting to note that the UK has always been a strong supporter of the single market idea against French push for centralised policy making à la Common Agricultural Policy. The European Union the British voters just rejected therefore owes much more to their country's than to the French or German vision of what it should be. Freedom of movement for persons is a case in point: The UK was very much in favour of enlargement and almost the only country not to put any restrictions on freedom of movement for citizens of the new member states during the 2004-2011 transitory period (although this was at least in part because it did not expect that many people to actually show up). There's an element of social integration in the free movement of people. I suspect it may help to keep wars off the table which is, I suppose, a financial consideration. ability to take on the obligations of membership, including the capacity to effectively implement the rules, standards and policies that make up the body of EU law (the 'acquis'), and adherence to the aims of political, economic and monetary union. If it did decide to become a member state and achieved these criteria, the changes to its internal social policies would likely be relatively recent and potentially controversial. The free movement of Turkish workers to the UK (or other long standing member states) or vice versa would, in theory, help to move cultural concepts between nations more quickly. Immigrants bring their own culture with them, and convey the ideals of their host country in the other direction. Tighter social integration leads to reduced tension, leads to less war. I think Relaxed gave a very good answer. Let me just add here why what Britain ideally wants, i.e. being part of the EU free trade zone without free movement of people would not be acceptable to the EU on purely pragmatic grounds, if we assume that the EU were to be open about changing the rules. First, as already mentioned in the discussion thread below Relaxed's answer, there is link between free movement of people and goods. But suppose that we would allow Britain to just impose its own rules on immigration as it sees fit. Then what is likely to happen is that Britain would restrict the movement of Eastern Europeans into Britain. The whole point of the Leave campaign was to restrict EU immigration, particularly Eastern Europeans. However, Eastern European EU members like Poland would find that unacceptable. A deal like that would mean a de-facto EU membership for Britain which violates the terms they signed up to the EU under, i.e. that some time after they became EU members their population would fall under the free movement of people rule. Poland would obviously not want to become a de-facto second class EU member, so they would veto any proposals along these lines. Most Western European politicians only care about it for ideological reasons – free movement of the Europeans is great. However, for less wealthy EU countries, the jobs in the U.K. make a genuine difference. The stereotypical Polish plumber earns much more money in the U.K. than he earns at home. Some of this money is being brought or sent to his relatives in Poland and this plumber or at least his relatives are voters in Poland, too. That's the simple reason why the Polish government (and a few others) naturally defend their citizens in these contexts, too. The other reason is that some of this money that gets back to Poland is spent or invested in Poland as well so it contributes to the Polish economy. However, this outflow has negatives, too. The Polish economy is losing some mostly skillful workers. That reduces the pool for the companies in Poland. I believe that when all the arguments are compared, it is a completely neutral thing for "all of Poland" whether the U.K. decides that it wants to keep the free movement or not. In the eurozone, there is an additional aspect to consider. Since euro countries have given up the ability to adjust their interest rates or their exchange rate, which both serve as tools to absorb the ups and downs of the business cycle, they need other ways to adjust to changes in the strength of economic activity. One mechanism is to allow workers in economically struggling regions and countries to move to economically stronger ones. How much labour mobility really helps the home country in an economic downturn is controversial. But being able to move and escape long spells of unemployment certainly helps individual workers. Continental Europeans are very attached to the single market, imperfect as it is. 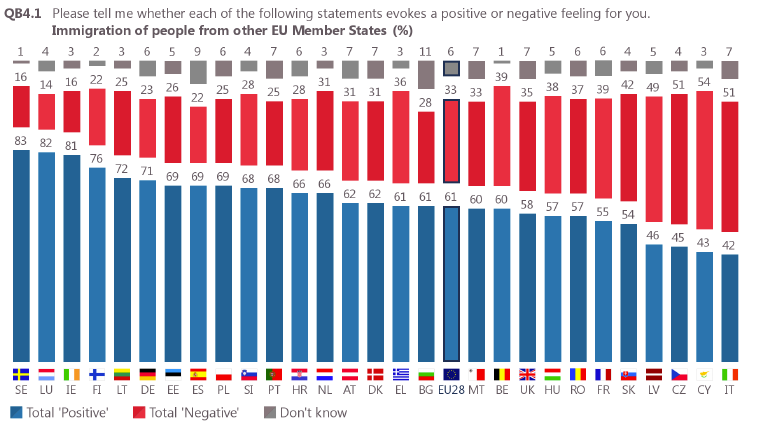 The latest Eurobarometer poll shows that 56 per cent of Europeans think that the free movement of people, goods and services is the best thing the EU has to offer (peace comes second, at 55 per cent). And a whopping 79 per cent of EU citizens support free movement of persons within the EU. Even the Swiss, who have only partial access to the single market, have to abide by free movement rules. In 2014, the Swiss voted in a referendum to impose quotas on EU migration, but Brussels has since made it clear that it would not accept a quota system. The EU has Switzerland over a barrel: the many bilateral agreements regulating EU-Swiss economic relations are tied together by a ‘guillotine clause’, so that the EU could cease all other agreements if Switzerland refused to accept free movement of people. Figure 1 [above] is a visual representation of the trade-off for a handful of relationships between the EU and non-EU countries where the vertices of the triangle correspond to full market access, complete freedom of movement of people and size of the financial contribution (as a percentage of Gross National Income). The largest triangle in black is the situation that the UK currently is in as a member state of the EU: the UK has full access to the EU market in goods and services, allows EU citizens to move freely in and out of the UK, and contributes about 0.5% of GNI to the EU budget, net of what it receives. Norway opted to join the European Economic Area (EEA) to have close to full access to the single market, both in goods and services. 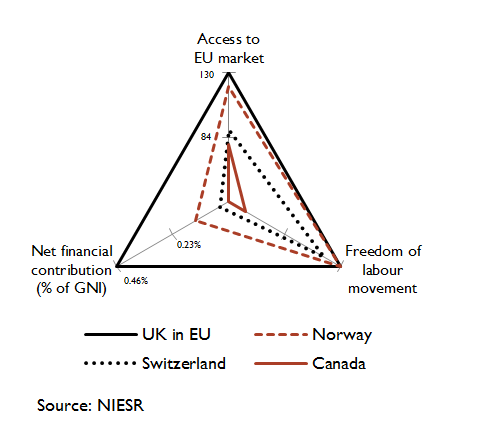 The dashed red triangle shows that, to be accepted as a member of the EEA, Norway had to agree to significant financial contributions (“Norway Grants”, amounting to 0.14% of GNI) and freedom of movement of persons. Switzerland’s bilateral agreements with the EU means that it allows freedom of movement of persons, makes a very small net budgetary contribution, but its market access is significantly reduced in the service sector. Finally, the trade deal with Canada (CETA) is less extensive than Switzerland and is essentially restricted to just goods. Canada does not make a budgetary contribution. According to their analysis Canada has (insofar) the most extensive association with the EU (more than Turkey) which doesn't provision for free movement. Any more extensive deal (Switzerland) had to agree with free movement of persons. Since some may wonder (like me) what does CETA do to deserve a score above zero on the free movement axis... there are apparently some narrow improvements in some areas lessening some red tape in getting work permits... but the details seem quite... bureucratic, so that mostly law firms have commented on them... summary being that "mobility rights under CETA [are] very complex" in no small measure because "each country of the Union has issued reservations concerning mobility rights." Why does the UK Labour Party support Brexit? Are there any other countries besides the UK that have movements to leave the EU? Why UK, Canada, Australia and NZ would not want to build a free movement union like EU? If a Brexit deal fails, is there a default fallback regarding movement of people? Can EU countries establish free trade agreements with the UK post Brexit?